With my most recent socks finished, it's time to start this amazing cardy. Ok, truth is I have plenty of projects on the go but I can't wait to start this one. The pattern is Twinkle Twinkle by Ruth of Rock & Purl. It appeared in Knit Now number 16, and credit to Babylonglegs who brought the pattern to my attention. She dyed the yarn for the one in the picture and is selling the same yarn especially for this project. 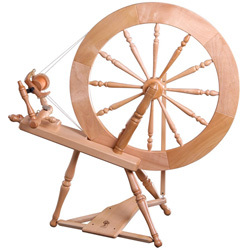 So to the spinning (I've actually been spinning for a few days and only have half a bobbin-full). I'm aiming for thinner than I've ever made before and more yardage than I've made in one go before. That's my new magnifier lamp. I've had one before but it died. Now that I've got around to replacing it, I realise how useful it is. Once over the shock of the state of your nails, it really does help - to spin very consistent, very thin and without having your nose close to the work. I heartily recommend one. 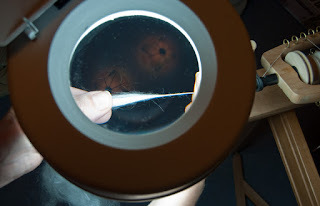 Oh my I've never seen anyone use a magnifier in spinning but I can totally see how it would help with spinning lace, lovely project to work on.